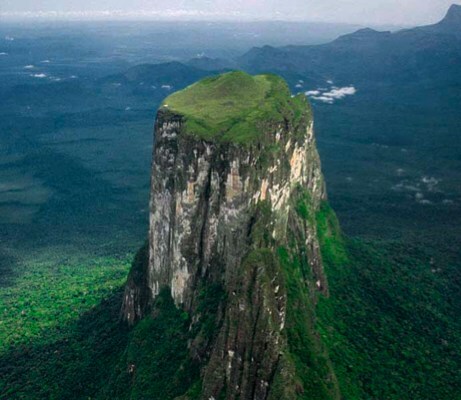 Mysterious mountain-sized stone blocks tower over the jungles of Venezuela and Bolivia. Could they be electrical uplifts? 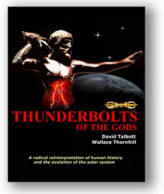 In previous Thunderbolts Picture of the Day articles, we presented a possible scenario for various stone monoliths around the world. We theorized that they are the result of electrical uplift within the spinning vortices of titanic Birkeland currents. Compression zones known as Bennett pinches, or Z-pinches, crush whatever material is within them into solids, leaving sandstone and granite blocks behind. In the three corners region of the Amazon rise formations of incredible strangeness and beauty. 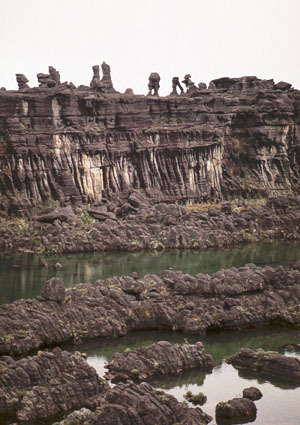 Called "tepuis" (mesas), they are sandstone monoliths similar to those we formerly discussed. 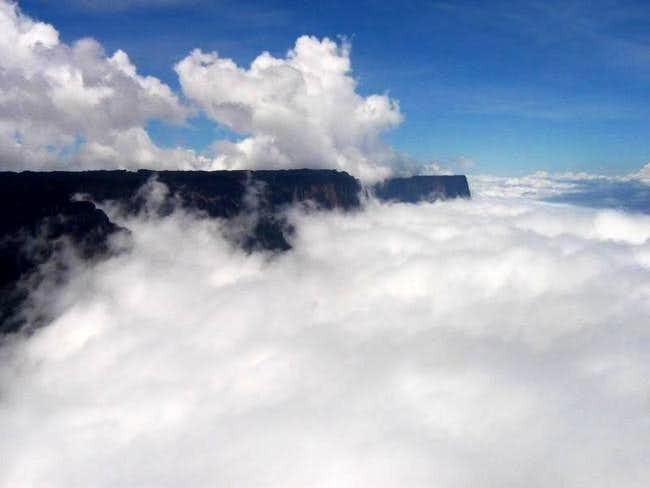 Roraima Tepui, the tallest of the Venezuelan sandstones, reaches nearly 3000 meters above the cloud tops. "Roraima" means, "Mother of Waters" in the language of the Pemon Indians who live in Paratepui and who act as guides for trekking expeditions. The description is apt because several rivers flowing into Brazil, Venezuela and Guyana originate on or near its summit. It was the first of the tepuis to be climbed 100 years ago and was probably the inspiration for Doyle's "The Lost World." 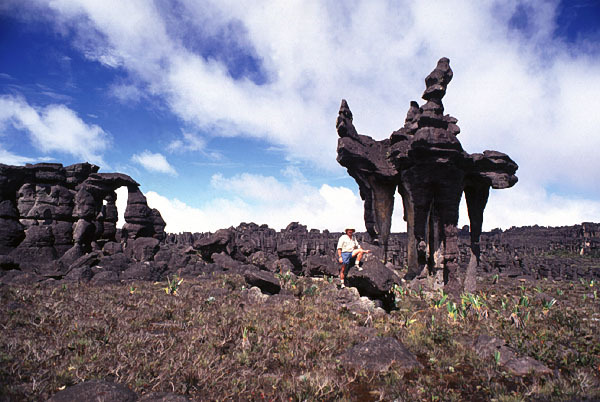 On top of Roraima Tepui is The Crystal Valley, a steep depression containing chunks of quartz in glittering piles. They can be gathered by the handful like crushed ice. 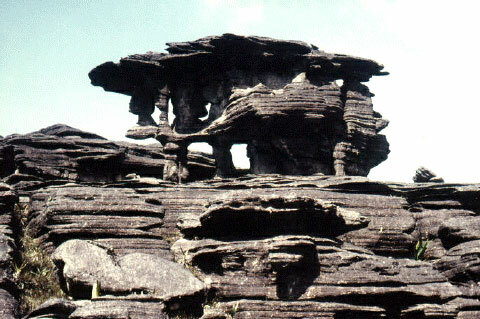 The tepuis are distinctive in other respects, as well. 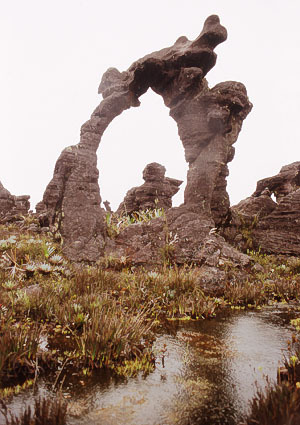 Because of their steepness and inaccessibility, the structures have developed unique ecologies that vary from one another and from the overall flora and fauna in the jungles at their feet. Although there are strange creatures living on the tepuis, there are no dinosaurs as Sir Arthur Conan Doyle hoped. The most famous tepui is Auyana, a 675 square kilometer monolith, out of which gushes the highest waterfall on Earth, Angel Falls. Also called Saltos Angel, the falls plummet 807 meters in a misty veil. Jimmy Angel accidentally discovered the falls that bear his name in 1935 while flying through the Devil's Canyon region. In 1937, he and an exploration team attempted to land on top of Auyuna, but crashed into the boggy loam. A 1000-meter vertical descent and an eleven-day slog through the wilderness brought them out with news of the site. There are other aspects of the tepuis that bear close examination. They are honeycombed with caves and tunnels that penetrate deeply into the rock faces, revealing formations like those we considered in another Picture of the Day. 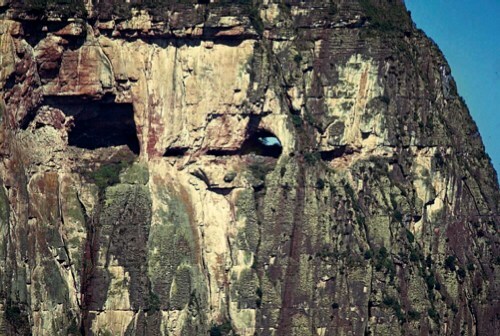 Inside the Cerro Autana tepui is a cave 430 meters long and 44 meters high made entirely of quartz. An enormous geode, in other words. Our Picture of the Day about Ben Bulben revealed strange rocks perched like stacked columns of loose boulders on many monolithic granite mounds. Logan Stones represent the mysteries surrounding the origin of mountainous, isolated towers. 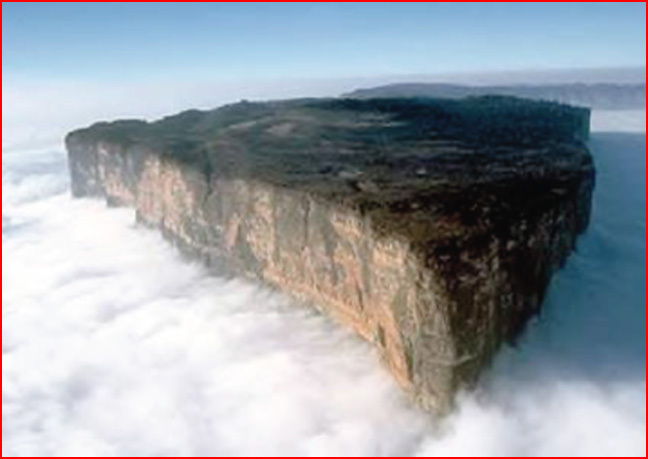 On top of the tepuis, such as Roraima, are structures that make conventional explanation all but impossible. Perhaps Kukenan is the most bizarre of the tepuis. The sandstone massif is visible from Roraima and has a waterfall fit to rival Angel Falls. The shapes carved into its walls and its flat top are beyond anything we have yet described. Sweeping arches, abstract sculptures, and giant fulgurites are everywhere. 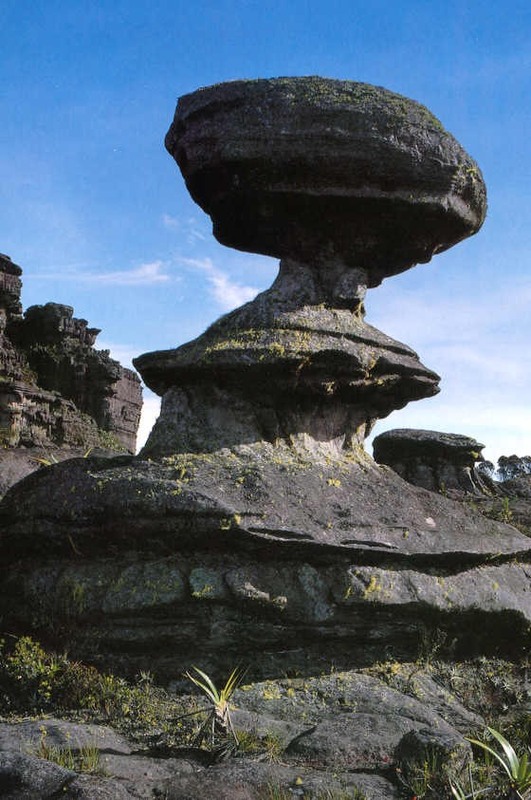 Because stone monoliths the world over - granite, sandstone or other minerals notwithstanding - exhibit the same geological phenomena, perhaps they were carved by the same force: electric arcs billions of watts hot.